Strike Gold and collect a wide range of bowling balls, themed alleys and game changing power-ups. Strike Gold and collect a wide range of bowling balls, themed alleys and game-changing power-ups. If you've been searching for a bowling game far ahead of any other, Gutterball - Golden Pin Bowling is your final stop. 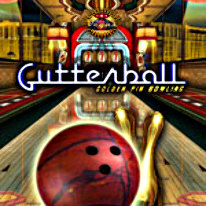 The Gutterball franchise has won awards and reached the number one spot on many of the major game sites. With a commitment to a standard of play, physics, features and quality, Gutterball continues to exceed the expectations of gaming enthusiasts the World over. It's your turn to be the judge.